On June 6th 2013, ISC held the “A shared Future: The KASC/JASC Symposium on U.S.-Korea-Japan Trilateral Partnership” in Washington DC. There were over 100 attendees, including university students, JASC and KASC alumni, as well as government and business representatives. The symposium focused on two panels regarding regional security and youth unemployment. A networking reception with ISC’s supporters and friends followed the panel sessions. Please click the link to view Yeonhap New’s article on the Symposium. 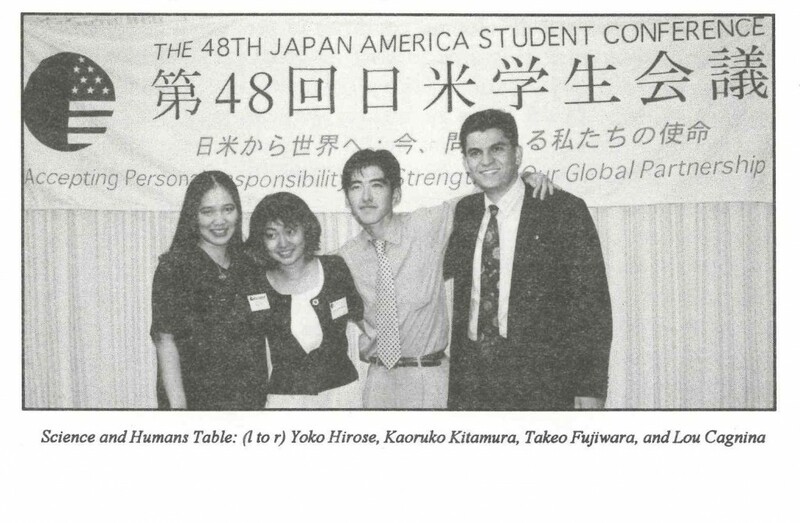 From left: JASC executive committee Cruz Arroyo, KASC Executive Committee Tiffany Vang, Ambassador Thomas Hubbard, Ambassador Kathleen Stephens and JASC alumnus Mr. Kunihiro Shimoji. 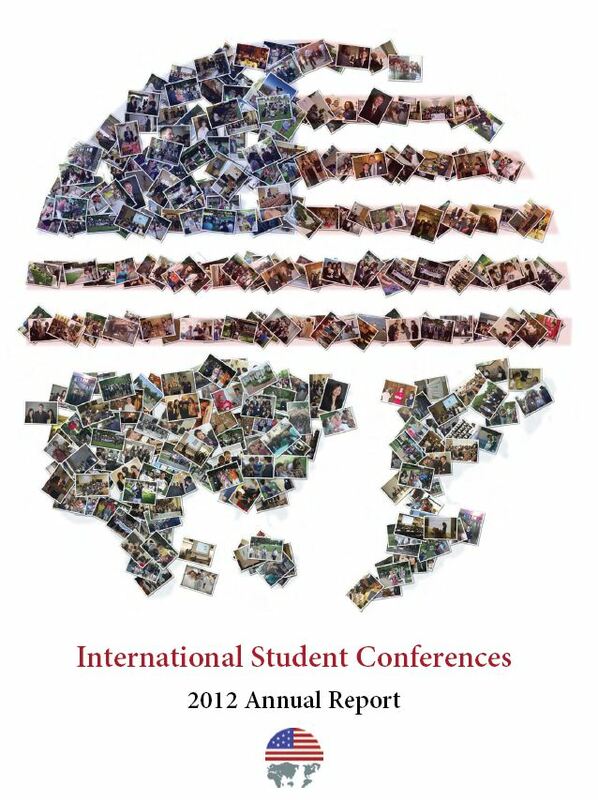 ISC’s 2012 Annual Report is now available online. 2012 was another successful year for JASC and KASC and we are looking forward to another in 2013. ISC would like to announce that an individual donor has established a scholarship in the amount of $3500 to go towards one student’s participation fee to attend the 65th JASC. The “Lou Cagnina 2013 JASC Scholarship” will be given in honor of the late Lou Cagnina, a participant in the 48th JASC(1996). The scholarship has been formed in Lou’s memory to provide funding for a student to enjoy the JASC experience as Lou once did. The scholarship will be open to those applying to the 65th JASC and the deadline to apply is the same as the deadline to submit the online application (March 1, 2013). For more information about the scholarship, including how to apply, please see this PDF. 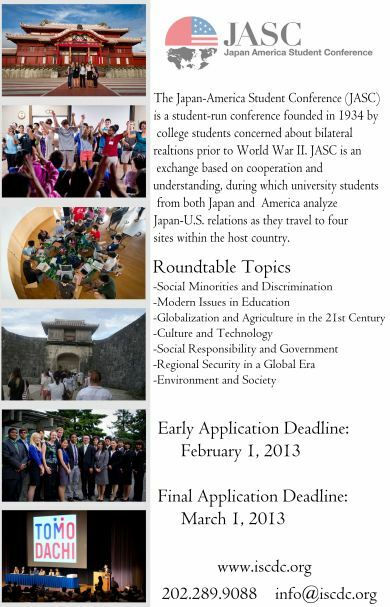 To start your application for the 65th JASC visit http://iscdc.org/apply/. Applications are now being accepted for the 65th JASC! Read more about the conference at www.iscdc.org/jasc/. More about the application process is available here. Once you’ve gathered all the information you need start your application. 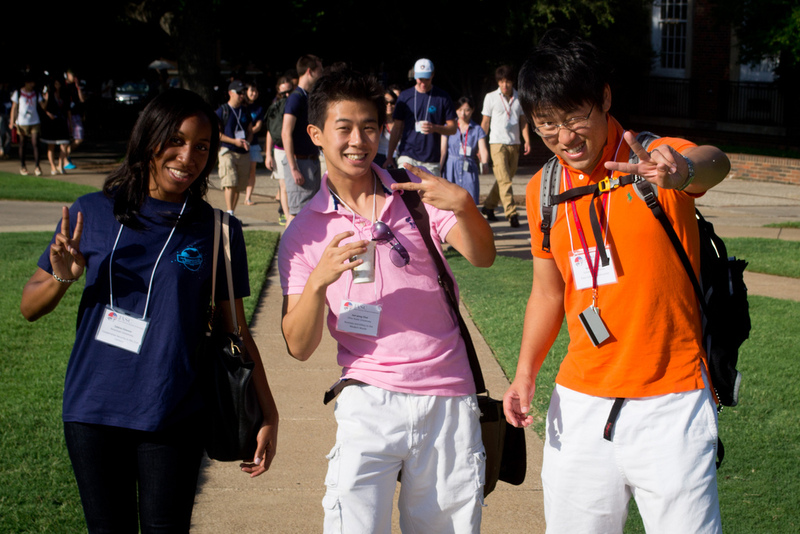 Write jasc@iscdc.org with questions about the application or the conference. The Executive Committee of the 65th JASC has chosen the roundtables for this summer’s conference. The roundtable format provides delegates a chance to explore the depth of issues and perspectives among peers from both Japan and the U.S. For more about the format of JASC please see www.iscdc.org/academics/. 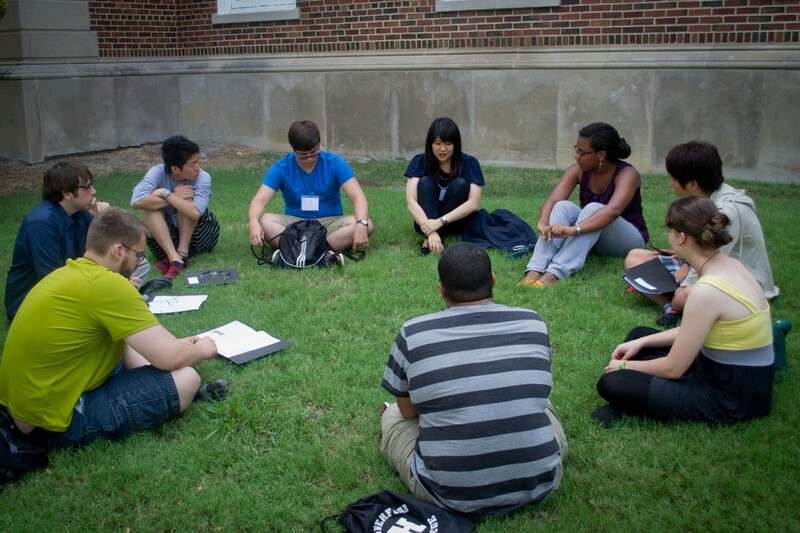 For the descriptions of each roundtable please visit the JASC 2013 page. Applications for the 65th conference are expected to be available before the end of November. 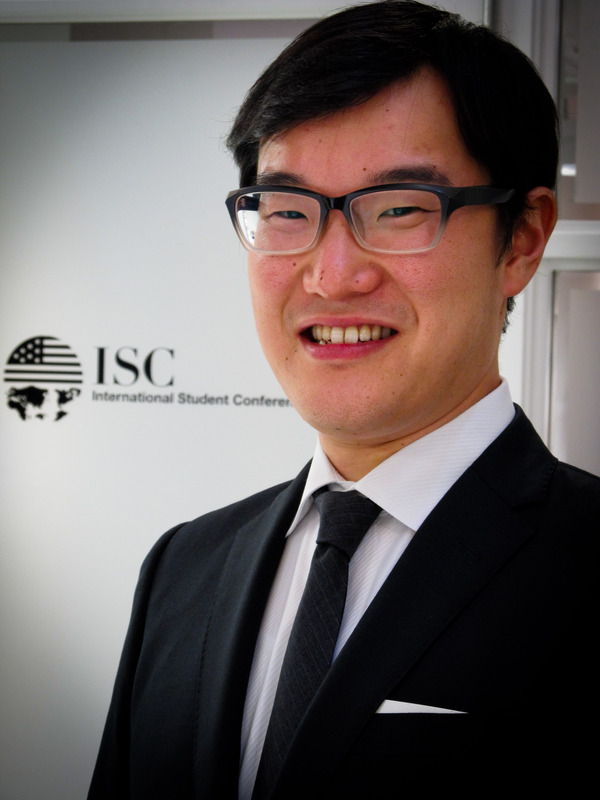 One passionate professional is becoming the new Executive Director of ISC. Yuuki Shinomiya, who was born in Cincinnati, Ohio and raised in Japan, says that the partnership between the U.S. and Asia is near and dear to his heart. Yuuki spent much of his childhood in Japan and returned to the United States as a Grew-Bancroft Scholarship, established in honor of the US Ambassador to Japan, Joseph C. Grew, to attend Oberlin College. Upon his completion of his B.A. he moved to Washington D.C. to pursue professional opportunities aimed at deepening international relations and partnership, particularly through public policy, trade promotion and cultural exchange. Most recently, Yuuki served as attorney-advisor with MetLife’s international business, helping support the company’s strategic positioning in all relevant political, regulatory and legislative areas. Prior to that, he served in the Office of Congressman Gregory Meeks (NY-6). Yuuki is a member of the New York State Bar and the New Jersey Bar. He is also a keen yoga practitioner and triathlete. He is excited for the opportunity to bring his professional skills and experience to a cause he has been passionate about for a long time. You can read more about Yuuki and the rest of the ISC staff at http://iscdc.org/about/staff/. 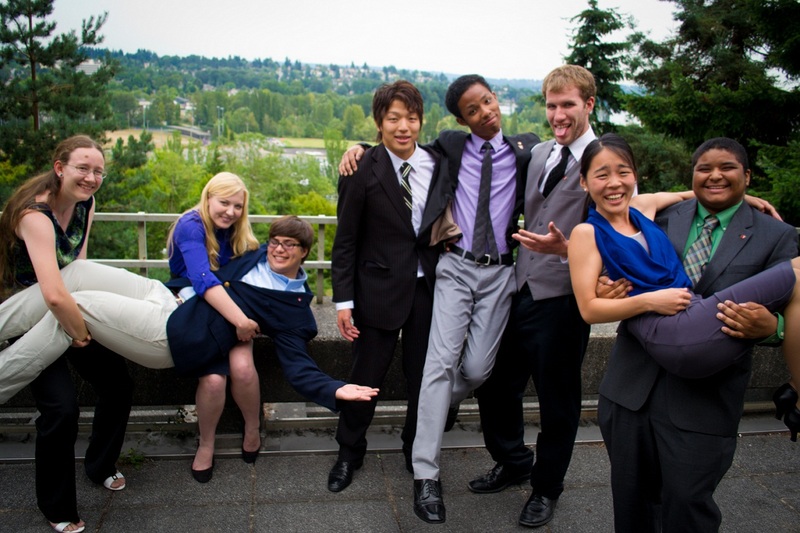 The 65th JASC Executive Committee was selected on August 17th, 2012 by their peers to plan and implement the 2013 meeting of JASC to take place in Japan next summer. Paul Yarabe (Harvard University) and Masato Takeuchi (Musashino University) co-chair the 16 member Executive Committee made up of 8 students attending universities in the U.S. and 8 attending universities in Japan. The group will work together closely for a year, choosing the sites of the conference, planning conference activities, recruiting and selecting delegates and finally leading a group of 72 students on the month-long conference in Japan. More about this year’s Executive Committee is available at iscdc.org/jasc/2013/executive-committee. JASC is pleased to announce its Spring Newsletter, featuring news, conversations, and insights from JASC student leaders and alumni. 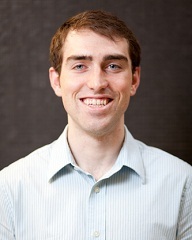 JASC welcomes a new Program Manager, Daniel Jodarski! 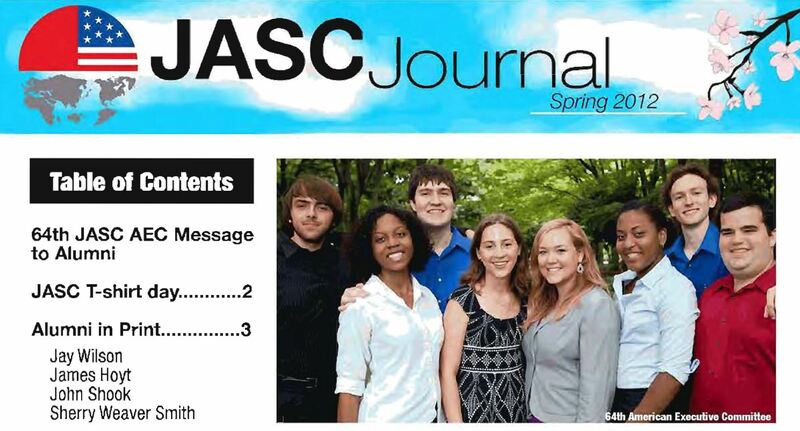 In this role, Dan supports students and alumni of the JASC program. Dan first became interested in Japan while living in an international dorm as an undergraduate at the University of Wisconsin La Crosse. He spent a summer in Japan studying Japanese language and culture in Aomori where he learned of JASC from an alumnus of the program. He later served as Student Chair of the American Executive Committee in 2011(JASC63) and led JASC through a challenging period (following the unthinkable events of March 11) that concluded with a successful and meaningful Conference in Japan. Dan holds a B.S. in Economics with minors in Mathematics and International Studies.